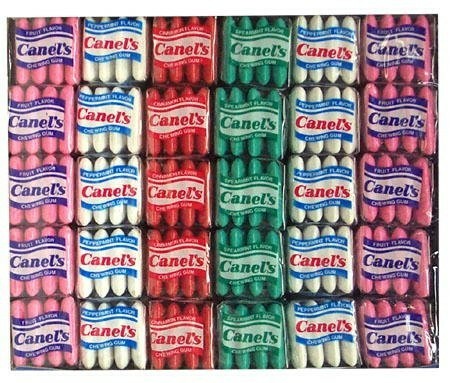 Canel gum are small bite size pieces of gum that are similar to the Chiclets gum and are a great change maker item for any c-store. 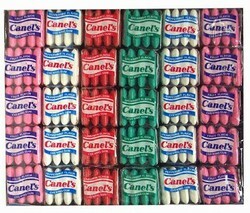 4 pieces of Canel gum are in each pack which sell at the store for around 10 to 20 cents. Each box has 6 delicious flavors and 60 packs are in each display. I have tried the fruity version w/ Banana, Cherry, green apple, tutti fruity & grape tasting ones. What makes them so good is they are not overwhelming... just right. less is more...they don't last forever though the shelf life is far better than most products intended for human consumption. A great choice, one of my top picks on the site. P.s. note:)they might have lasted longer had i not consumed them:)~3 years.